Jacks Pot is a new video slot with 5 reels, 25 fixed paylines, an enhanced free spins round and 3 progressive jackpots. Jack is a little creature with red hair and big teeth. The reel symbols are suspended in mid-air between the roof and the floor of the cave. Caverns stretch away into the haze in the background and Jack loiters on the left hand side, occasionally catching and eating a green gem which drops from above. The most valueable symbols are coloured gems growing out of rocks – purple, orange, blue, green and red. The wild symbol is a collection of coloured gems. The Wild substitutes for all other icons except the scatter (a rudimentary drill). The bonus feature is triggered by landing 3 or more of the drill scatters anywhere in view. 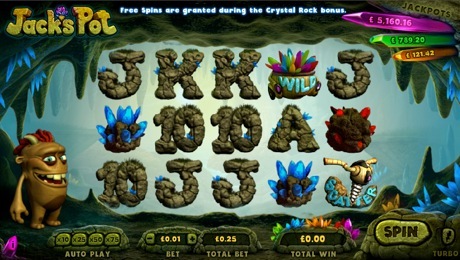 You must select one of the six rocks on the screen to determine your award. The award will be up 10 free spins, plus 2-3 amber wilds if you're lucky. Amber sticky wilds are added to the reels on every free spin to help you out with bigger wins. The jackpot feature is triggered randomly but the bigger your stake, the better the chance of it happening. If the feaature is triggered you will be shown 4 coloured crystals, so just pick one and you will receive one of the 3 jackpot amounts or all 3 jackpots at once.